In addition to loving food, I am a traveller. I find it exhilarating to visit new cities and will seek out new places to visit as often as I can. If I will be in a city for a meal, I will very often try to find a local joint, eschewing fancy for interesting. In some cities, I seek out a particular cuisine (seafood in San Francisco, deep dish pizza in Chicago), but in many locations, I am simply looking for a good meal at a good price. Lucky for me, I also watch television. Diners, Drive-Ins and Dives to the rescue! And No Reservations. And Best Thing I Ever Ate. Well…you get the picture. Food travel shows have just exploded and the advantage is I get to see some cool places to eat when I travel. The only problem is that I don’t see all the shows and even when I do, I don’t write down the restaurants. Lucky for me, I have the Internet. TV Food Maps to the rescue! This ingenious site provides you the location for all of the restaurants on those travel shows. You can search by show, by location or even from a map. So when I will be traveling, I will often look in the area I will be staying to see where I can go. If my trip is a road trip and it will be a long one, I may pass through many different cities and even using the TV Food Map site could take some time. Lucky for me, they have a road trip feature. Enter your starting location, you ending location and the distance you a willing to deviate from the standard path and it will find all the places in its database for you to check out. Check out TV Food Maps here. You don’t have to look long and hard to find this dish, just look below! 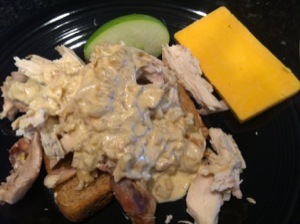 You can bake your own chicken or do what I do and use a grocery store rotisserie one. 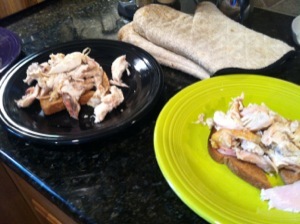 Shred the chicken and Place on a slice of bread (I like to lightly toast them). Make the sauce and pour it over. 1) Heat oven to 450°. Season chicken with salt and black pepper. 2) Heat oil in an ovenproof skillet over medium high heat. Add chicken, skin. Side down, and cook until crisp and lightly browned, about 5 minutes. 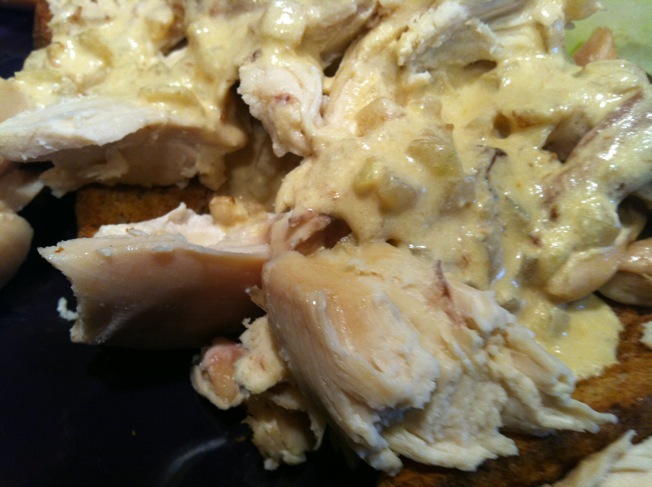 3) Turn chicken skin side up and sprinkle with 1/2 teaspoon of the paprika. Pour any excess fat from pan. 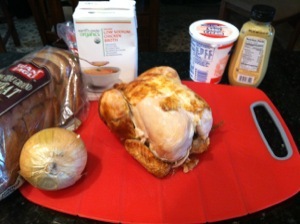 Transfer to oven and roast until chicken is just cooked through, 25 to 30 minutes. 4) Transfer meat to cutting board. Set skillet over medium high heat. Add onion and cook until softened, about 3 minutes. Add broth, sour cream, mustard, remaining 1/2 teaspoon paprika, and cayenne. Simmer, scraping up browned bits from bottom of skillet, until liquid is reduced by half, 3 to 5 minutes. 5) Remove meat from bones and slice thinly. 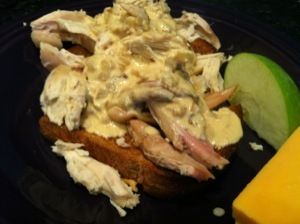 Arrange on toast and spoon gravy over chicken and bread. Serve, sprinkled with parsley.